Trump Is Off On A Big Vacation. Here Are All The Times He Said He Wouldn't Do That. Let's get one thing out of the way right at the top: Barack Obama went on a bunch of vacations when he was president. Here are the Obamas enjoying Florida's Panama City Beach in 2010, for example. Look! And here's the former president and daughter Malia bicycling in Martha's Vineyard in 2013. Fun! In March 2016, the New York Times catalogued a bunch of Obama's notable vacations as president. The first family enjoyed stays in Maine's Bar Harbor and at Camp David, as well as multiple trips to Hawaii and Martha's Vineyard, among other destinations. Not to mention the international trips! 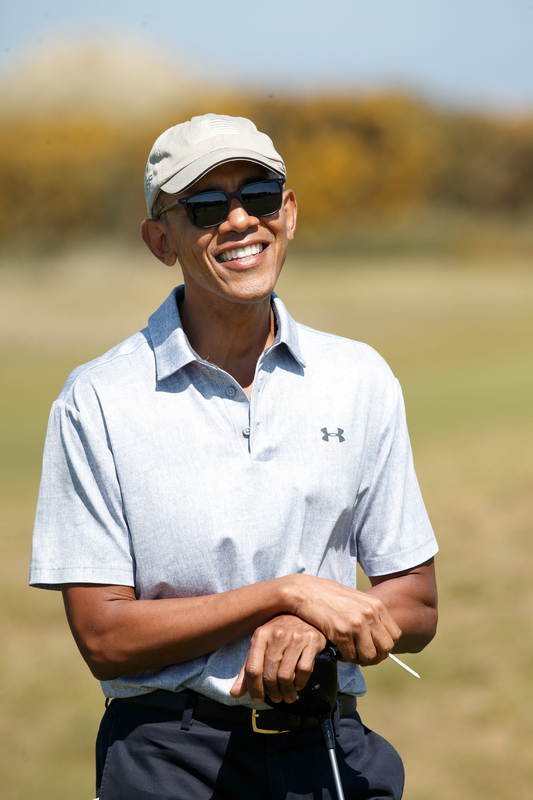 Obama, of course, also played a lot of golf. The former president played some 306 rounds during the eight years of his presidency, according to Golf Digest. CBS White House correspondent Mark Knoller put the figure even higher, at 333 rounds. The point is: Being president is hella stressful!! No matter who you are. So on Friday, President Donald Trump is embarking on his first vacation as commander in chief. He's heading to his golf club in New Jersey for 17 days, according to the Associated Press. Administration staff won't officially confirm Trump's travel plans, but the AP reports the move is driven in part by renovations to the White House heating and cooling system. Of course, when the president goes away from the White House, he still has to receive important daily briefings and respond to urgent matters. You never really stop being the president, you see, even if you're sitting by the pool with a tiki drink at Mar-a-Lago. But here's the thing: Trump repeatedly attacked Obama for enjoying any time off as president. At a Michigan rally in March 2016, for example, Trump told the crowd, "Obama likes relaxing and going on vacations. Me, I like working. I like working. I really do. I like it!" That same month Trump vowed to stay at the White House and "work, work, work" if he were elected president. "There's no time for vacations," he said. "If you're at the White House and have so much work to do, why do you fly, why do you leave so much?" Trump said. "You think you'd want to work, work, work." In a speech the following month, Trump again bashed Obama for going on holidays. "I don't take vacations like Obama," he said. "His whole life — the guy takes a six-month vacation twice a year. It's terrible." "He flies that big 747 to — he wants to play a round of golf, he flies it to Hawaii, then he flies it back, then he says the carbon footprint is being destroyed! I mean give me a break," Trump said. "[Obama] goes out and plays golf so much that he doesn't have time to convince Congress and do it the way it's supposed to be done," Trump said at a November rally in New Hampshire, referring to Obama's signing of executive orders. "He's played more golf than most people in the PGA tour." 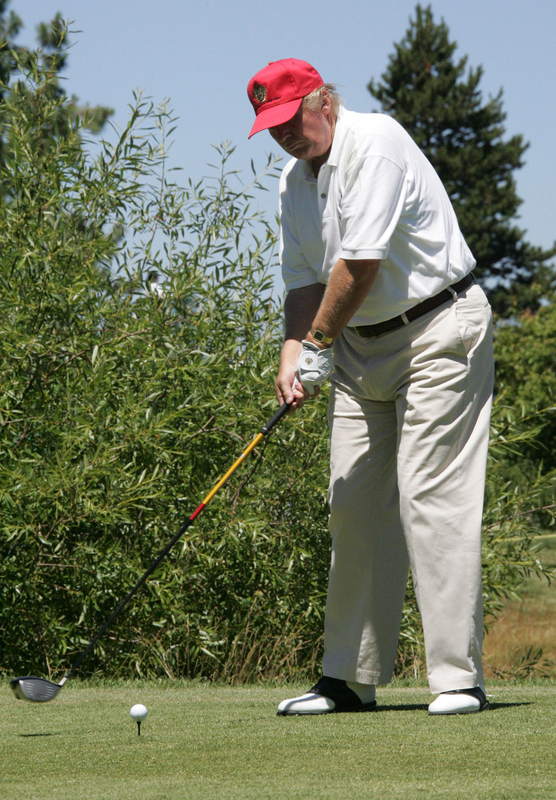 "This guy played hundreds of rounds of golf," Trump said way back in April 2015, before he even started running for office. "I shouldn't complain. I own golf courses all over the world. So I shouldn't be angry at him. It's good — except it's not good because he should be doing other things." Then, of course, there are the many, many, many tweets mocking Obama's vacations. Here's just a sampling. When @BarackObama is not vacationing, he is hosting his top donors in the White House http://t.co/RAB2Lahw Always having a good time! His @BarackObama's specialties? Vacations and campaigning. Jobs not so much! Obama’s motto: If I don’t go on tax payer funded vacations &amp; constantly fundraise then the terrorists win. It's Jan. 2. President Obama should end his vacation early &amp; get back to Washington to straighten out the ObamaCare catastrophe--or end it. Not to mention all the times he tweeted about Obama playing golf. Trump has marketed himself as anti-vacation for many years now. "Don't take vacations. What's the point?" he wrote in a 2004 book. "If you're not enjoying your work, you're in the wrong job." But the fact is, most of the people I know that are successful really don't take vacations. Their business is their vacation. I rarely leave. You know that. You and I are friends. How often do you see me going away? I never go away. I love it. Now, I'll go down to Mar-a-Lago in Palm Beach, Florida. But I own Mar-a-Lago, it's a very successful club, and I'll work. I go crazy when I have to go away for a couple of days on a vacation. So, if you really love what you're doing, you never take vacations. You know, when I go away I end up buying something in the community that I go away to. So, I'm always sort of working. Back in November, after Trump won the election, he told 60 Minutes reporter Lesley Stahl that he did not think he would "be very big on vacations." STAHL: What about vacations? You're not going to take any vacations? You've said that. TRUMP: We have so much work. There's so much work to be done. And I want to get it done for the people. I want to get it done. We're lowering taxes, we're taking care of health care. I mean, there's just so much to be done. So I don't think we'll be very big on vacations, no. Who wants to leave the White House to go to some other place and be away on a vacation? The White House is very special, there’s so much work to be done, I’m not gonna be leaving much — I mean a lot of work to be done — I’m gonna be in there working, doing what I’m supposed to be doing — but who wants to leave the White House? And just a few days after his inauguration, Trump told Sean Hannity he "[likes] working," and doesn't "go too much for the vacations because I'm bored." Now, since he became president, Trump has spent some 58 days visiting his private clubs and properties, including 43 days at his golf clubs, according to an NBC News tracker. Trump in Scotland in 2012. That includes 25 days at his Mar-a-Lago resort in Florida. We can't say for sure how much each trip costs, but PolitiFact says it's likely taxpayers have to pay a few million dollars each time he heads down there. FWIW, PolitiFact also found that as of Aug. 1, Trump had played golf 21 times as president, compared to 11 times for Obama at the same point in his tenure. The difference is that Obama officials told the press what he was doing (and who he was playing with), while Trump's aides repeatedly tell reporters that when he visits his golf clubs it's for meetings and phone calls — but then pictures emerge of him on social media hitting the links or dressed in golf attire.